Weight / Stone: 86.60 lbs. Face Ft. / Pallet: 36 sq. 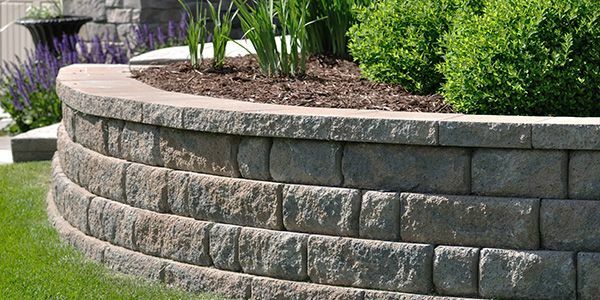 ft.
Utilizing the success of its predecessor, the Anchor Diamond®, Anchor Diamond Pro™ takes retaining wall construction and appeal to a higher level. With the patented rear lip design and a larger facial profile, construction, alignment, and setback are facilitated. Anchor Diamond Pro™ stones are available in straight or beveled face styles and in a variety of colors and blends. A full one-square-foot face complemented by a natural texture makes the Anchor Diamond Pro™ a beautiful addition to any landscape. And behind that handsome, rugged exterior is a hollow core that lightens the stone for easy handling and installation. Engineering innovation allows it to tackle the tallest, toughest wall designs.